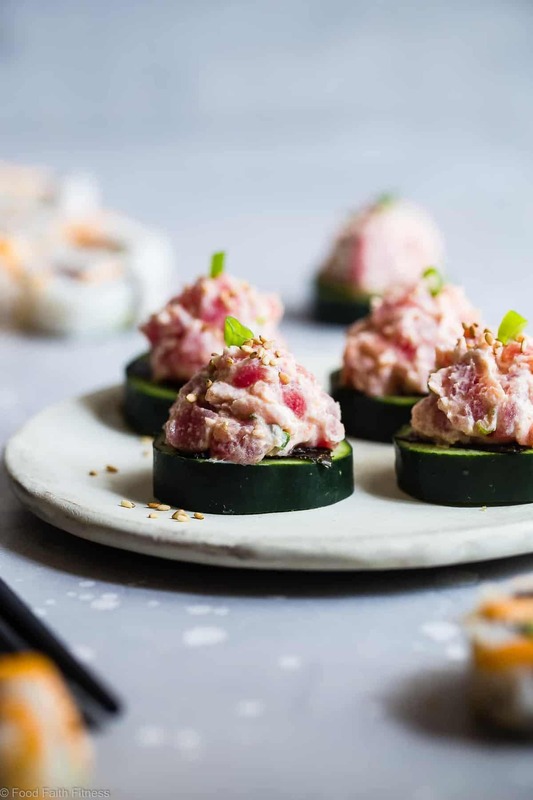 These quick and easy, 6 ingredient spicy tuna bites are a healthier spin on the classic spicy tuna roll that has all the taste without the fat or carbs. Perfect for a light lunch and has zero Freestyle Smartpoints! You know that time when you really wanted sushi? But then you remembered that time where you tried to make healthy california rolls at home and ended up frustrated at your lack of sushi rolling skills, covered in sticky rice (they don’t call it sticky for NO REASON) and you ended up just making a peanut butter and jelly sandwich instead because #IGIVEUP? Making homemade sushi is, liiiike, REALLY hard and SOSOSO time consuming. But wait, I have you covered! You could eat a sushi burrito, some spicy tuna rice casserole, a paleo sushi bowl or T-H-I-S spicy tuna “roll” on a cucumber. <– Health! Today, you guys, we are doing some serious trickery fo’ yo’ tastebuds and doing a ninja Greek yogurt swap. I promise they won’t know the difference. Take that mayo AND sticky rice. You lose. Insert evil laughter and creepy finger twiddling here, just because you can. I don’t even know. Moving along. The best part of these is that in only takes 5 minutes to get yourself from point A to spicy-tuna-roll-a-go-go land. I have no idea where that is, but you want to go there right? Yes. Confession: these little puppies (tuna-ies?) ALMOST did not happen due to the fact that sushi grade tuna was VRY VRY expensive-o at my grocery store! 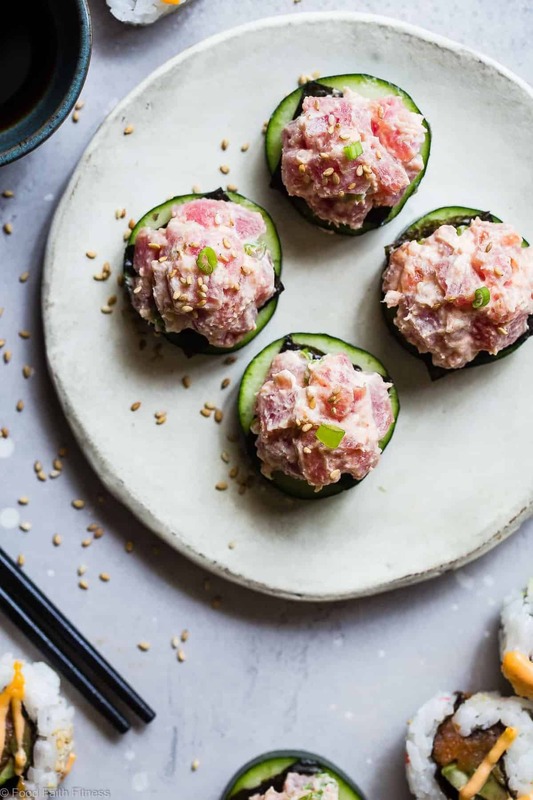 I walked out of there trying to figure out how to break the news to Mr.FFF that we would have to sell the future baby FFF (which, sorry to break it to you, will probably never exist) so that I could make this spicy tuna bites recipe. Either that or ask him if he would still love me with one arm, as I would have to sell the other. Luckily for the future rugrat I found a fish market that allowed me to purchase the tuna without the selling of said never-happening-anyway baby FFF. I am also happy to report that I am typing this with 2 hands, attached to 2 arms. Let me just tell you guys, relief x 1000 over here. “Phew” is an understatement. 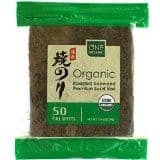 What is sushi grade tuna? Sushi grade tuna is the highest quality of fish that can be sold. 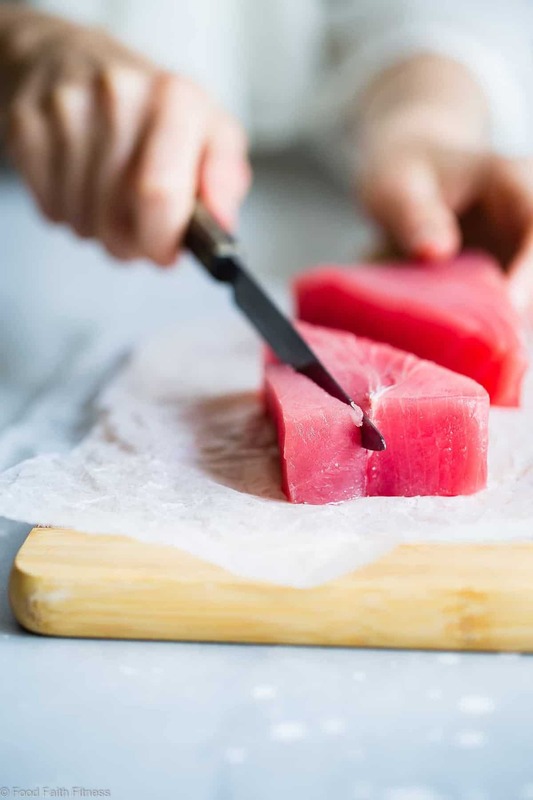 Tuna is inspected and graded and “grade 1” is what you would call “sushi grade.” This seafood is frozen to REALLY COLD temperatures to kill parasites, so you will find it in the frozen area of your grocery store. Any supermarket that says a fish is “sushi grade” but it’s sitting behind a glass counter, in the open air, is NO GOOD. 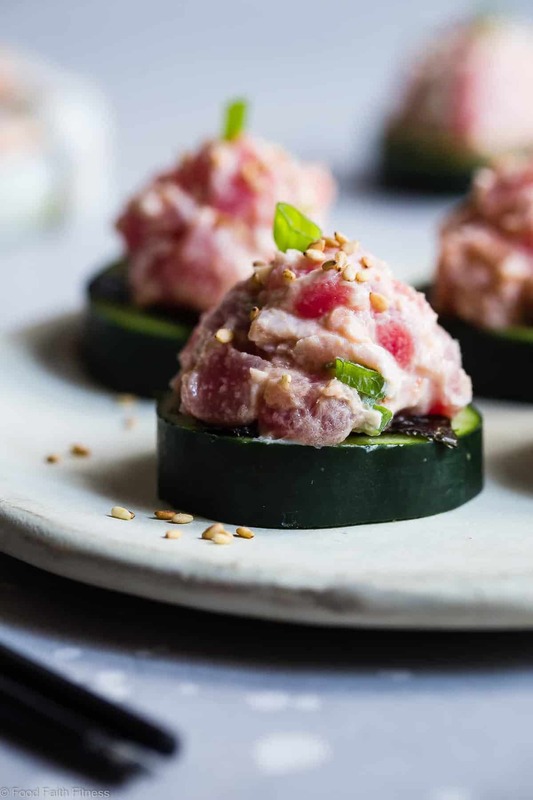 It’s VERY important that you use sushi grade tuna to make these tuna bites, since you are going to be eating them raw. Now is not the time to use canned tuna, like when we made paleo Mediterranean Tuna Salad. So, now that you’re armed with the spicy tuna bites FACTS, do you want to put your flippy floppies on and do the healthy-spicy-tuna-on-a-cucumber-roll-dance this with me? Do you not know how to do it? Side note: the one thing I do know is that flippy floppies are mandatory. 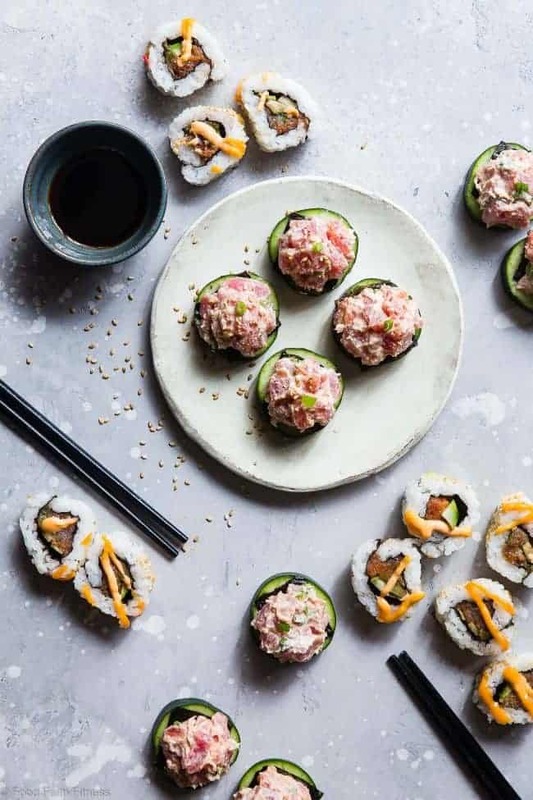 These quick and easy spicy tuna bites are a healthier spin on the classic spicy tuna roll that has all the taste without the fat or carbs. Perfect for a light lunch! 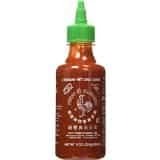 1 - 1 1/2 tsps Sriracha sauce, to taste. Slice the cucumber into 1/4 inch thick circles and lay out onto a plate. Dice the tuna and green onions and place them into a medium mixing bowl. Into the bowl, add the Greek yogurt, sriracha, garlic powder and salt. Make sure to taste and adjust the salt to your preference. Scoop about 1 Tbsp of tuna onto each cucumber and garnish with additional sriracha and sliced nori (if desired.) Alternatively, if you want it to taste even more like sushi, mix some extra minced nori into the tuna mixture. 5 minute sushi is my kinda sushi – these sound so good Taylor – thanks for sharing – Happy New Year! Adding these to my NYE menu! YUM! Great, thanks! Let me know how you like them! 🙂 Happy New Year! I love swapping out mayo for Greek yogurt. I do it a lot. It doesn’t sacrifice flavor and it saves tons of calories. Win-win. These look delish! Happy New Year Taylor! Oh girl… I could eat these bites ALL DAY – EVERY DAY! What a great way to snack. 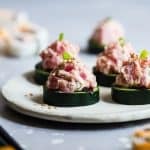 I am always looking for ways to spice up tuna and these little bites look delicious! I do enjoy sushi;) but I’ve been sticking with tuna from a can recently. These bites are impressive! Talk about flavor punch – and they’re healthy! They look incredible! Thank you so much Mary! 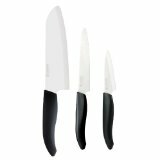 You have to try the real deal tuna with these babies! I love this recipe for lots of reasons, but especially because it’s another idea on how to use up cucumbers! I know right, I never use the whole things and they always go bad! Thanks Pamela! Ok I’m totally not a seafood fan at all but if I were, these would be first on my list to eat. They look awesome! Love the creativity! Thank you so much Rachel, let me know how you like them! These look delicious! I”m so glad I stumbled across your site, you have delicious looking recipes! Happy New Year! Those look so amazingly delicious! 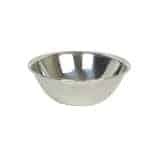 Would go great with some Japanese spicy mayo dipping sauce! So pretty! I love tuna, as do my kiddos. I think this would be beautiful for Mother’s Day! What a tasty little one bite treat! Love the use of Greek yogurt instead of mayo….yum! Wowee, wow, wow! These look completely scrumptious! I have never thought of sushi as being carb laden, but I guess it kinda is made out of white rice. Now I’ll just make these instead. Glad you had two arms to create this recipe! Right? It can be healthy, but can easier go over the edge (I’m looking at you tempura california rolls) Haha Thanks Andi! Happy Friday! haha…how many of these tuna things had you had when you wrote this? So zany…but I love zany, your blog, and how easy these look! I’m one of those types who could eat tuna every day. I think it’s from growing up eating so much of it. These look amazing, Taylor! Pinned! Thank you Becca! I love tuna too! Love the spice factor on these bite size morsels, Taylor! This tuna treat is perfect for every party. But for me I can eat these bites every day. And with the spicy that’s an original idea. Splendid! Amazing! Great that these are low carb and high protein. Makes for a good lunch for sure! Oooh, I love love ahi tuna! These low carb bites are fabulous!!! These are gorgeous! And my tuna loving son will go crazy for these!